It is early March and I am planting peas. The wan spring sun is finding its heat and lays like a warm hand upon my back as I work. Signs of approaching spring fill my senses in the mild air on my skin, the scent of damp soil and the shrieks of children as they run in frenzied circles of freedom, much like the birds swooping and circling above whistling their mix of songs. We have passed the first intoxicating days of air that does not bite, endless sun warm enough to melt the last snowfall into a composition of dripping and trickling, soften the soil and make one’s blood run with the abandon of a stream overflowing with spring thaw. The dawns have come noticeably earlier and the muted indigo dusks have lost the sharp quickness of winter and softened to a moist lingering evening. Perhaps it is the phase of the sun or the moon, the proximity to the vernal equinox or some eternal voice that speaks to those who will listen about the time and season of things, or my own impatience to join in with the cycle that has been going on without me for a few months. Whether it is any of these reasons or all of them or none of them, I awaken one day in March every year with the knowledge that this is the day to plant the peas. It is as clear a yearly anniversary for me as any holiday, and can never be planned. This particular morning, awakening with this revelation, I reviewed the process of planting and imagined once again the garden I had been planning since the previous autumn, fed my cats and stepped out onto the deck with one or another of them and my coffee in hand as the sun lifted above the horizon. I listened to what the birds said in their morning song, closed my eyes and caught the scent of a chill early spring morning to find its opinion, and felt the warm sun wash assurance over my face and thereby determined that, yes, for whatever reasons, this day was right for both me and the peas. I sorted the packets of peas out of the basket of seed packets, found the jars reserved for this purpose and filled them with warm water, opened the packets and counted the peas into the jars, taping their names around the jars to keep them sorted. The peas would soak for a few hours, welcomed into this world with a gentle bath, softening their outer layers and awakening the seedling within. Seedlings are growing under lights in my basement, but at this stage they could be houseplants for all that they represent food. Planting the peas is the real thing. Putting seeds in the ground is an act of faith and trust that both you and nature will do your parts, that neither will you plant your peas under the wrong conditions and expect them to survive nor will nature scramble the seasons and instead of turning toward summer, turn back toward winter and eliminate the growing season. It is a promise to honor the needs of the seeds you sow, and so be rewarded with their provender. Going about my daily business of checking the e-mail and the fax and making and returning a few phone calls, I was really only biding my time until the sun warmed the area of the garden where the peas would be planted. In early afternoon I dropped everything else and changed my clothes, preparing to break my own dormancy, clear the debris and decay of inactivity and begin to set my own seeds for another year of activity. I had fondly reviewed each step of the process of planting peas while I completed the other necessary responsibilities of the day, and the outline of my task for the day was clear, but it was also leading me to visions of the garden to come and my excitement was building. Dressed in a flannel shirt over a t-shirt, jeans and rubber gardening clogs, I opened the basement door and burst outside, the first of many days I would do so. I chose my tools and moved everything to the long, narrow planting bed along the fence. This bed gets full sun nearly all day and has the best drainage for spring planting, and as they grow, the peas can twine their tendrils through the fence wire, giving the plants themselves the maximum amount of sunlight on their leaves and making the mature peas much easier to find at harvest time. A slight breeze rustled dry leaves stuffed into corners of the garden and caused bare branches to click and rattle together. The earth’s crust looked dull gray-brown and callused with winter debris and clumps of frostbitten soil heaved up as the soil froze and thawed through the cold, but as I cleared away and turned under a winter’s worth of last year’s remains from its surface the moist soil beneath looked as rich as chocolate cake. As I applied my spading fork, gently pressing, lifting and turning forks full of soil to loosen it for roots to sprout and stretch an early robin followed close behind me. She ignored my polite question about her health and comment on the weather, intent instead on being the first to grab the fresh treats upturned by my work. While the robin, joined by others, continued diving at creeping soil dwellers startled by their abrupt turn of soil, I rolled the wheelbarrow to the compost bin. I lifted the layer of tangled plants and autumn leaves to expose the fine humus beneath, last year’s garden trimmings and kitchen vegetable scraps recycled by nature to fertilize this year’s harvest. The robins hardly noticed my approach as I wheeled the barrow back to the bed and only moved a few feet up or down the bed as I began dropping forks full of compost over the soil and turned it under in another pass with the spading fork. The steady work warmed me, rinsing the winter’s cold and stiffness from my muscles and bones, and already I felt stronger, more balanced, with more purpose to life than when I had awakened that morning. Even though little puffs of cold air still rose from shadows, working under the warming sun I found I could stand for the first time in a t-shirt, letting light breezes brush my arms, imagining what, in just a few months, would feel like unbearable heat, and this barren landscape of a backyard garden would be a humming, buzzing, lush tangle of growing things. My cats divide their time among prowling the yard, inspecting in every corner and under every shrub for messages from other animal visitors to their yard, helpfully supervising my work, watching with narrowed eyes, then walking down along the furrow to check its precision, and napping for the first time in the warm spring sun on a bed of dry leaves. Cookie, Namir, Stanley, Sophie, Moses, Allegro, Kublai, all my garden companions through the years join me for this annual event as I watch the ones who approach me for pets, and fondly remember the antics and habits of those who are here in spirit. Then it was time to draw the furrow, one long, straight row all the way down this narrow bed. As the furrow grew I remembered pea plantings from previous years, envisioning little sprouts in the soil, dainty white blossoms all over robust vines, delicate tendrils reaching out and upward, fluttering leaves creating a complicated pattern in shades of green with sunshine and shadow. As the last act of preparation, I got three thick, short twigs and, visually dividing the bed into four parts, one for each variety of pea, I placed a twig as a divider. In the kitchen, I put the jars of soaking peas into a little basket then took them down to the garden while trying to decide in which order I should plant them. I plan my garden pretty thoroughly, but always allow for some last-minute decisions. I could stand there all afternoon debating with myself the best order for planting the four different varieties while grackles and blue jays kept a running commentary on my activity and everything else around, their squeaks and whistles and pops thrown from one to another from tree to tree and sometimes joining together just to make noise like a crowd of boisterous people. I know there is no need for change in what I had planned. Everything was ready, and it only remained to actually put the pea seeds in the furrow. My fingers slightly apart over the top of the first jar, I held the jar close to the soil and walked along the bed in the first section, pouring the peas’ soaking water into the furrow, then filled the palm of my hand with some actual pea seeds. The peas, softened, warm, nearly hummed with life as I pushed them around in my palm. Carefully balancing my handful of pea seeds I dropped to one knee at the end of the bed. Taking one pea seed and then another in two fingers of one hand from the palm of the other I placed them one after another an unmeasured inch apart as if offering a gift. Creeping along on one knee in a seemingly ancient ritual of supplication, I continued down the bed, planting each of the four varieties in the same way, suppressing the surges of my inherent impatience borne of a life adapted to automation, with the orderly, sustained labor itself, letting the job take the time it needed to take, enjoying the activity, enjoying the travel without concentrating on the destination. Now the pea seeds stretch like a strand of irregular freshwater pearls, pale green in their rich brown velvet bed of nurturing humus, plump from their soaking, fully awakened and ready, as I was this morning, to rejoin the cycle that has been turning while we have been dormant. Each one contains the ability to sprout, sink roots down into the soil and push cotyledons up through it, grow leaf after leaf, branching, reaching and climbing, its intent to give life to potentially hundreds of progeny. 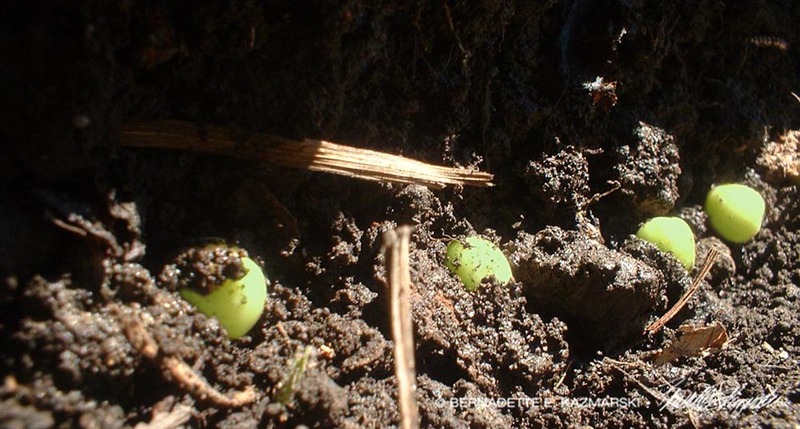 These peas have so many odds against them in the immense challenge of bringing new life into the world and the responsibility of carrying on their species, and yet their only defense is to stand there and take whatever is spent on them and do their best to fulfill their biological obligation. Surely after so many generations of being tossed into the soil and left on their own they have learned some organic equivalent of fear, yet they show no concern at their position but seem excited, eager to get on with the process. I know it will snow again this season, the soil will freeze again, clutching around each tender seed, the rains may fall too much or too little, the heat may rise to an unusual summer’s pitch earlier than is expected, all of these things and more have happened in other springs; the conditions for life are never perfect. And suddenly, as every year, I feel a rush of protective love for these brave little peas, and that bond between a grower and the growing thing is formed, and I know, and the peas know, and everything else I will plant and nurture in this little space I call my own, that I will keep my part of the bargain and protect and support them in any way I can, and they will do their best with what is given them, and in the end they will gladly give and I will enjoy whatever gifts they have to offer, be it nourishment or visual delight or practical necessity. Birds flying overhead cast moving shadows across the warm dark earth as I work, their paths crisscrossing as if to bless my activity as I move back along the row with my hoe, gently piling loose soil over the peas, surrounding them with all the nourishment I can give them, and then again as I return with the watering can, soaking the bed from end to end in my final act of planting before I leave these peas on their own. A haze of high, thin clouds has formed on the southwest horizon, dulling the sunlight with a gossamer veil. I can once again feel the chill of winter and put my flannel shirt on over my t-shirt, gather my tools together and begin putting things away. Still at its lower winter angle, the sun will soon fall behind the tips of bare trees, then behind rooftops, then behind the silhouette of the edge of the earth, bathing this newly-turned bed full of pea seeds in the soft lavender of an early evening in late winter to be followed by the encouraging glow of a waxing moon. Later, when the lavender twilight has deepened to an indigo dusk, the moonlight faded behind clouds then dissolved into a cold blue-black night velvet with moisture, I will hear the first few raindrops tap against the roof and windows, weighted with sustenance gathered from the earth in this thaw. As the drops are joined by more and yet more until there are no more individual drops, I will imagine each drop washing the soil down around each pea, pressing it ever so gently into the hand of its mother, who will cradle it, giving it the divine spark of its new life. And I have once again passed this anniversary and rejoined the cycle.